Cubic Zirconia beads are gorgeous! The sparkle, fire, and brilliance of CZ are what have made it well known as a diamond substitute. These beads are very hard and optically flawless. Earrings are 1.73″(44 mm) long. Please let me know if you need them to be customized in any ways. They will add a perfect touch of flair to your outfit. It will be a nice addition to your evening/special occasion dress! CZ earrings will make a great present. Your order will arrive in a nice pouch and a box ready to be given. Solid 925 Sterling Silver post. Created Opals are actually preferred to natural opals for many jewelry items. Natural Opal is not particularly well-suited to being used in many jewelry applications since it is a relatively soft gemstone, breaks easily, has to be protected from sunlight and many chemicals and it requires ongoing care and maintenance. Opal earrings are very light! They will bring a perfect touch of flair and splash of magnificent colors to your outfit! tiny Swarovski crystal for the finished look. Arrays of different colors are captured in beautiful opal cabochon! Necklace is 18″ long but you can wear it much shorter- it’s adjustable..
Opal necklace will bring a perfect touch of flair and splash of magnificent color to your outfit! You can wear it with your evening dress or favourite jeans. Earrings are 1.25″ long. Please let me know if you want them to be customized in any ways. sterling silver lever backs with a bail. Bermuda blue color has blue and green hues. Sparkling and mysterious! It will add a perfect touch of flair to your outfit! They will be a great addition to your evening dress. Earrings will make a great gift! Your order will arrive in a nice packaging ready to be given. Capri Blue earrings are 1.89″(48mm) long. Please let me know if you need them to be customized in any ways. tiny white pearl for the finished look- 4mm. Freshwater pearl is floating on a branch. Total length of the necklace is 18″, but you can wear it shorter- it’s adjustable. Please let me know if this needs to be customized in any ways. Love birds necklace will make a great gift! Your order will arrive in a nice box ready to be given. 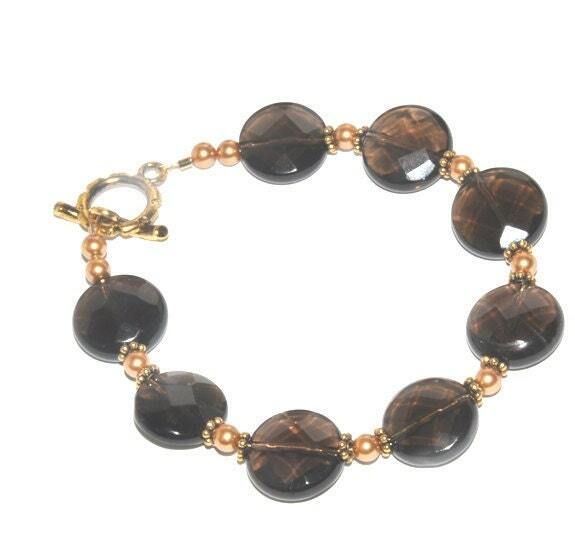 Smoky quartz bracelet will make a great gift. Your order will arrive in a nice gift box ready to be given. Bracelet size – a little bit over 7″ (you need some extra length for toggle clasp). Please let me know if you need it to be longer/shorter.